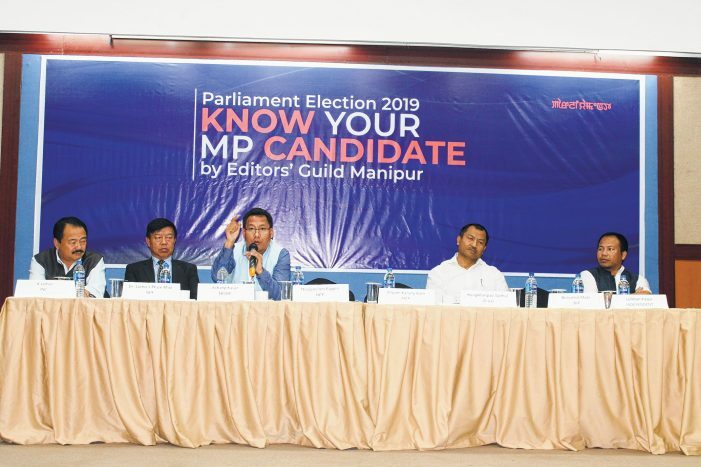 For the outer Manipur parliamentary constituency in the upcoming general election 2019, identity and minority issues came as one major subject of debate at the “Know Your MP candidate” – an event organised by the Editors’ Guild, Manipur on April 4, wherein all candidates of the outer MP constituency for the 17th Lok Sabha election were invited for an open session debate. The other topics are, Citizenship(Amendment) Bill, border issue, development etc. Even as AFSPA have not figured in party manifestos or agendas in any of the earlier or previous elections – be it either state assembly elections or parliamentary elections, this time outer MP candidates mention and laid emphasis on the subject. The issue of “minority” community voters who falls under the outer MP constituency – communities who are voters but do not enjoy the “privilege” to stand for elections were key topic of presentations by the candidates and subsequent deliberations and debate. According to the Indian National Congress (INC) candidate James Kasung, in the next delimitation of constituencies “one more MP seat from the inner parliamentary constituency will be carve out”. Following this, the subject of granting “ST status” for Meitei community also came out as one major key topic of deliberation. The outer MP candidates though could not, or were not in a position to give concrete answer or ‘promise’ on the subject. While former minister and MLA, Hangkhapao Taithul – the Janata Dal (United) candidate, stated that the issue is in the hands of the state government, other candidates opined that the subject matter lies in the hands of the expert committee or concern authority, most importantly the state government. Most of the candidates, for obvious reasons, feels that this is not the right platform or “too early” to give their commitment or otherwise on granting ST status to the Meiteis. Among the eight candidate in the race from outer Manipur constituency, five of them turn up for the live telecast debate. Perhaps this is a telling situation of the geo-physique of the outer Manipur constituency in that, it isn’t easy to come down to Imphal for the event. With the voting day drawing near and campaign in full swing, most candidate could not make it. This physically difficult situation is well presented by the INC candidate James Kashung who stated that Manipur, even though is a small state, the area covered under the outer parliamentary constituency isn’t easy to cover. That he has travelled around since he joined politics from 2018, Kashung had been touring the hill districts, which he says lacks in all parameters of development. “There is huge gap in development” he says “people in these areas do not even know their MP”. In-fact the INC candidate launched his flag hoisting campaign from his residence in Imphal – surely for more visibility. For a candidate representing a regional party, Asang Kaisar of the North-East India Development Party ( NEIDP) emphasize to “ be different” from the “national” parties. Dwelling on the need to protect identity and opposing mega “national” policies he emphasis on the village he hails from – Chadong, where the Mapithel dam had displaced a large number of homes and people. An activist oriented Ashang Kaisar’s rational for joining a regional party being that ‘national parties’ agenda are imposed from outside – from Delhi, where the interest and agenda of a small state like Manipur or NE are never considered. According to the NEIDP candidate “national parties are dictating the states”. For Kaisar, he choose to “stand out” – that he did rather be a “different color” than be of the same color among a sea of people. Kaisar asserted that he would rather fight than beg from one corner of the country. According to Naga Peoples’ Front (NPF) candidate Dr Lorho.S.Pfoze “Truth” is the keyword – the foundation. That there must be “understanding” of “aspirations” between communities which he stated is a meeting point. Much as he is from a Naga Party, he emphasis that he represents the “Naga People”. Candidates for the outer parliamentary constituency, specifically regional party candidates in Manipur, largely underline on topics like AFSPA, protection of indigenous people, opposing Citizenship (Amendment) Bill and the need for an end to AFSPA. A former MLA and minister, Hangkhanpao Taithul of the JD(U) dwells on peace and communal harmony in Manipur. A diplomatic and a veteran politician Taithul calls for a government under the leadership of Nitish Kumar, the JD(U) supremo. Hinting at a “third” party government – that of a non-Congress and a non BJP government. Student activist turned politician, Benjamin Mate of the Bharatya Janata Dal (BJP) who had been on the other side of the fence during his activism, joined politics to be “within the system to change the system”. Being a candidate from the ruling party, a confident Mate, took the opportunity of the event to take a dig at the opposition Congress. According to the BJP candidate, the INC is no longer a party that is taken seriously anymore. All in all, voters in outer Manipur parliamentary constituency seem, unsurprisingly or obviously, to be divided along community or ethnic lines. Issues are diverse and complex, whether candidates will be able to take calls after they are voted to power remains to be seen. Absence of a women candidate is conspicuous but invisible as usual with reservation for women not even figuring as a topic for deliberation. Quoting INC candidate James Kashung, one crucial and noteworthy is that most voters in interior areas, do not give much importance to MP election and that people forget all about the election after voting. Truly, many indeed do not even know the candidates. EGM’s initiative is a significant one in that, even though the live telecast debate is limited to the viewers in the capital or urban areas and unlikely to reach voters in interior villages.